Ricky Mullins was painted as a cruel pet owner of a vicious dog by neighbor Donna Falkenback after her Chihuahua was attacked and killed by his pet Pit Bull, Hank, last month. Mullins says he was wrongly portrayed after being charged with dog at large, Oct. 19, and that he has not only shown remorse but attempted to make restitution with Falkenback, who has refused to work with him, on more than one occasion. Mullins answered the charges in General Sessions Court, Nov. 2, and the charge of dog at large will be retired when the parties come to terms on reasonable restitution to recover Falkenback’s loss. Mullins said he was shocked when he returned home on the afternoon of Oct. 19, and Falkenback came to his driveway alleging his Pit Bull, Hank, had attacked and killed her Chihuahua. Mullins said that conversation was the only one between Falkenback and him regarding the incident. He says her claims of lack of remorse and an unwillingness to even help clean her back porch were unfounded. Mullins said Hank had run free on the property during the three years he had owned him after purchasing the dog as a pet for his son. Since the incident Hank has been kept on a lease and now stays inside the Mullins’ home. Mullins said he was not certain it was Hank who had attacked Falkenback’s Chihuahua, but also could not prove it was not. In the meantime, he attempts to make restitution while making sure citizens realize he is a remorseful person who understands his neighbor’s loss. Nothing can be done for it and no help available. Should I simply shoot the offending animals? How long must I endure this from both inconsiderate people and obnoxious animals...? Buy some pepper spray or mace and when the dog gets close enough to bite you shoot them in the eyes. Then you don't hurt the dog permanently, but you still protect yourself. I guess Hank had a hankering for Mexican? the pit should be put down before it mauls a child. They make dog repellent as well if you can't find the mace or pepper spray. And, if the owners give you any crap tell them to tie their dog up and there wouldn't be a problem. P.S. Keep the spray handy just in case you need to use it twice. Pit Bulls have a bad repurtation, and is do to the ones that are very cruel to animals. Any dog can attack. It's not any type of breed. Pit bulls have this on there heads only because people like to fight them and still are. Untill these fighting dog rings are stopped, pit bulls will be targeted. I have a pit bull. She is a wonderful dog. She gets along with my children and other animals. Good luck to you and Hank. goofy, i agree dog fighting is cruel and inhumane and should be stopped but will totally disagree with your type of breed issue. Selective breeding has taken place for thousands of years (since the domestication of canine). This has been done to enhance different qualities such as herding skills, hunting, draft and the list goes on. You have brought into your home and have your children playing with an animal bred to bring out the not only maximum bite qualities but with relentless viciousness. Many of man has tamed the tiger and some have been eaten. Please for the safety of your loved ones, investigate this issue more yourself and i believe you will come to the same conclusion-these loving animals may have there place but it is not in our homes and communities and especially with our children. They are ticking time bombs waiting to go off. If you must have one for some odd reason please keep your animal confined to protect me and my loved ones and also be sure to neuter the animal to reduce at least a little of their explosive trigger. Tennessee has a lease law, Period, an animal may get out occasioally, which is unfortunate, I was bitten a little while ago by a dog, which the owner said "he wouldnt bite a biscuit" that was the most intense pain I ever had, "My dad always said, "Fences makes good neighbors. I would never Leave my place with my dog out. It is just good sense. I was told by my neighbors once that neibors children threw rocks at my dog through the fence. Can you imagine what may of happened if he had not had his fence. Everyone just keep your dog inside a fence and the problem would be solved, with the dog, but maybe not with cruel neighbors. Im sorry to read about Hank, Maybe this can be worked out. I do know how it is to be accused of something that I did no do. Was there any more dogs about the property or maybe one that was just passing by. Did the lady witness the attack.Just saying. Rachel, I agree but disagree with you. While you are correct that certain breeds are developed for certain skills; however, I still believe these type of animals must be trained to fight. It's more how they are raised than doing something just because the canine happens to be a certain breed. Just because a child is born to two murderers does not automatically mean that child will murder. It's more how a person (or in this case, dog) is trained and raised that will determine how they act. As I also agree and disagree stinnet. How a dog is raised and trained is a tremendous and possibly the most significant factor in the animals disposition but this species of dog (as well as others) have been selectively breed for massive jaws, jaw muscles and a will to viciously bite and continue to bite until total submission. Two of these animals can and have not only taken down adults but inflicted terrible bodily damage and death. as for your analogy, you don't really believe that is a real comparison do you? Two very tall, muscular and strong murderers will raise (most likely) some big strong youngings. Yes? Although I don't know if they would be prone to killing others, I would keep a close eye on them and make an effort not to anger them nor even think of hiring them to care my children. Prejudice maybe, cautious for sure. Just for the sake of safety--get your kids a collie (or one of MANY breeds bred to be loving companions). Rarely ever hear of these breeds biting, much less maiming and or killing. it's the same story...pit bull attacks, owners says i don't know why, never been aggressive before. when will people accept the fact that pit bulls are an unpredictable breed. and what is even the point of owning one? maybe it's an attitude of the owner of i just don't care what others think. i'm shocked by what the owner said "i am aware of the nature of a pit bull and (here it comes...) MOST of the time it depends on how they are raised." I'm not going to leave a gun lying around the house unloaded "most" of the time. Ya know you people should really think of it as what if it was you and your pet? Really? You shouldnt be rude and you for sure shouldnt be cruel to animals! I dont see anybody being rude and which pet should I be thinking of - the attacker or the one that got viciously killed? I think the moral of this story is the woman could not prove who killed her small dog. If she lives in a rural area it could have been a number of things, including a coyote. Either way in some cases when a dog sees a smaller dog like that they don't know it's another dog...they may see it as a squirel. If they have never seen a smaller dog they could mistake it for anything. Pit bulls are highly misunderstood, do not blame a dog for being a dog. They are not misunderstood if you realize they are loving domesticated animals bred to relentless biting machines if and when their triggers go off. If you want an attack dog that has massive bite qualities then a pit is on your list but as I stated before PLEASE contain your animal for the safety of the rest of us. Yes all people should contain their dogs, I understand some people may not like my dogs so I don't let them wander, but it's mainly for their own safety. I own a pit bull mix and I know these animals are misunderstood, I would trust my life to her and my future children's lives. Pit bulls actually are breed to be aggressibe toward other dogs, not humans. That's exactly why people fight them, the dogs will not attack their owners or other people who enter the ring. And that is why people take such advantage of them, they are completly misunderstood and were once used by the military and are still used as search and rescue dogs. They are intelligent and loyal. Pits actually don't have a different bite quality than other dogs, there are some that have stronger bites but a pit is not on that list. Any dog can bite and do damage. Don't blame this beautiful pit bull, she reminds me of my baby and I can tell from the picture she is sweet and loving. Ricky, Hank is a beautiful dog! I can tell he is kind. Good luck in all of this, I know it must be hard but keep your head up and don't let people label Hank just because of his breed. steph- Rick is a fine fellow with a great family and there is no doubt in my mind they are hurt over this situation. I dont mean to woop a dead horse but please investigate the temperament of a pit with 'those in the know' and I believe you will see I am correct. 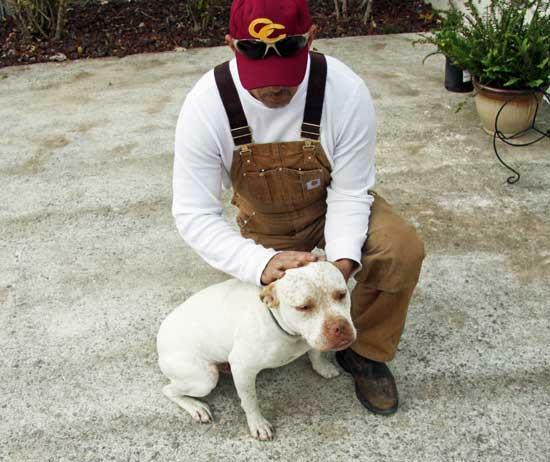 Parts of USA and other countries have laws to specific breeds (pits and bull terrier breeds) that restrict (like muzzled in public) or out-right bans on the breed. This has been done based on attack and breed facts. Encourage people to make wise decision on pet selection to ensure what is right for both owner and pet. Ask Gayle Tate " I want a family dog. What breeds should I stay away from?" I bet pit bull is on his list. Ask that same question of 100 vets. You will be shocked. I can tell we are alike in that we both love our pets immensely. I cant imagine not having my dogs. They are my best friends. Most of my dogs are rescues and mutts (with the popularity of pit many mixed-breeds have some pit in them). I wish you all the best in the future and with your dog.